In the above verses, Jesus decided to feed the hungry crowd because he had compassion for them. 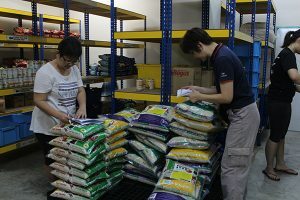 Likewise, it is compassion that drives Hope Kitchen and our volunteers to engage the community through the provision of food to families in need. 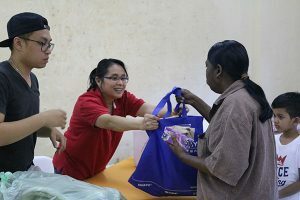 Since 2011, we have fed more than 300 families and provided the practical help many needed to pull through a tough time and stand on their own feet again. 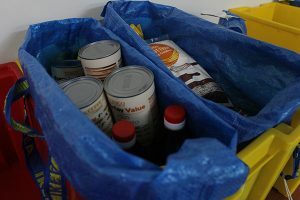 Hope Kitchen has two on-going programmes: Food Bank and Community Feeding. 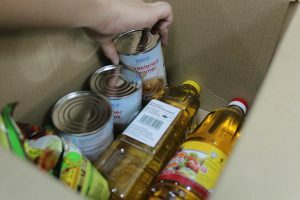 Through the Food Bank which was started in 2011, we identify and serve low income families by providing them with basic essentials such as rice, cooking oil, milk powder, flour, canned food to supplement their daily survival and help them cope with the city’s rising cost of living. 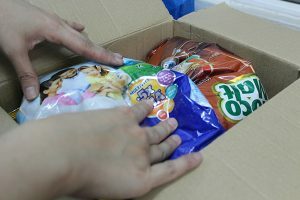 Currently, about 70 families are receiving monthly supplies from the Food Bank under this programme. 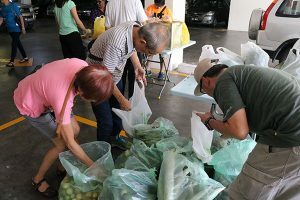 Through the Community Feeding programme which was launched in September 2017, we collect raw vegetables, fruits and bread from various sources twice a month and distribute them to residents living in low cost flats in the vicinity of Sentul, Selayang and Batu Caves. Currently, about 300 families benefit from this programme as they come forward to receive the vegetables every month. The provision of food to families in need is the church’s ongoing effort to engage the community with the aim of imparting HOPE to them. You too can impart this hope by becoming a volunteer with our team, or by supporting this ministry through monetary offerings designated to Hope Kitchen. 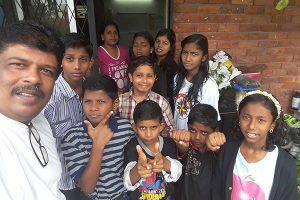 RUMAH DESTINY is Metro Tabernacle’s first launch into its social concern ministry and was started on 1st November 1998 to provide a home for the underprivileged and abused children. It is part of the ministry of our church to reach out to the community and living up to a loving, caring and sharing spirit. It was officially launched by the Minister of National Unity and Community Development, Datin Paduka Zaleha Ismail on 14th August 1999. Since the inception of the Home, more than 50 children have walked through its door, totally transformed as they learned about Jesus Christ and accepted Him as Lord and Savior. 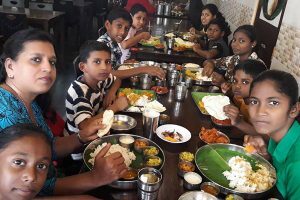 We have since re-modelled the way we run our Home whereby the children under our care are brought up holistically in small family units to receive maximum love and care. Rumah Destiny was relaunched with the new model in 1st June 2015. It is located at No. 1 Jalan SG 6/3, Taman Seri Gombak, Batu Caves, a corner double storey terrace house with four rooms, catering to 8 – 10 children. The VISION of Metro Tabernacle A/G for its social concern ministry is to care for the underprivileged in our society society by sharing lives and blessings through a loving God to create opportunities for those we care for and for those who care. To provide a residential home for orphaned, neglected, abused and unprivileged children so that they may be cared for physically, mentally, emotionally and spiritually to lead self independent Christian adult lives. To provide a meaningful ministry for members of Metro Tabernacle A/G to be involved in caring for and sharing with the underprivileged in our society. To serve as an evangelistic outreach in our community by providing a living testimony of God’s love and grace to all who accept Jesus Christ as Lord and Savior. Rumah Destiny is registered with the National Social Concern Department of Assemblies of God General Council. 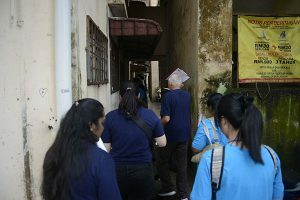 It is led by a Management Committee and Senior Pastor Rev Ong Sek Leang as her advisor. The Home is managed by a full-time home parent, a full-time home assistant and volunteer staff.